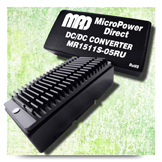 Now available from MicroPower Direct, the MR1511S series is a family of single output 15W converters packaged in a compact 1 x 2 inch case. They are designed to provide the ultra-wide input range, robust filtering, rugged packaging and high reliability required for railway/transit applications. Five standard models operate from wide 40 VDC to 160 VDC (110 VDC nominal) 4:1 inputs, providing tightly regulated single outputs of 3.3, 5, 12, 15 or 24 VDC. Standard features include line/load regulation less than 1.0%, input/output isolation of 1,500 VDC, a remote control input and efficiency as high as 89%. All models are protected for output short circuit faults and output over current faults. The MTBF (per MIL HDBK 217F) is greater than 1.0 Mhours. The MR1511S family is packaged in a compact 1 x 2 x 0.46 inch case. The pin-out is industry standard. Operation is specified for the wide industrial temperature range of -40°C to +85°C (an optional heat sink is available to extend the full power range of the unit). The MR1511S series is has been designed for use in rail and transit applications. They provide the high reliability, compact size, wide temperature operation and compliance to standards required for use in rail equipment.